The knit that almost did not make it. 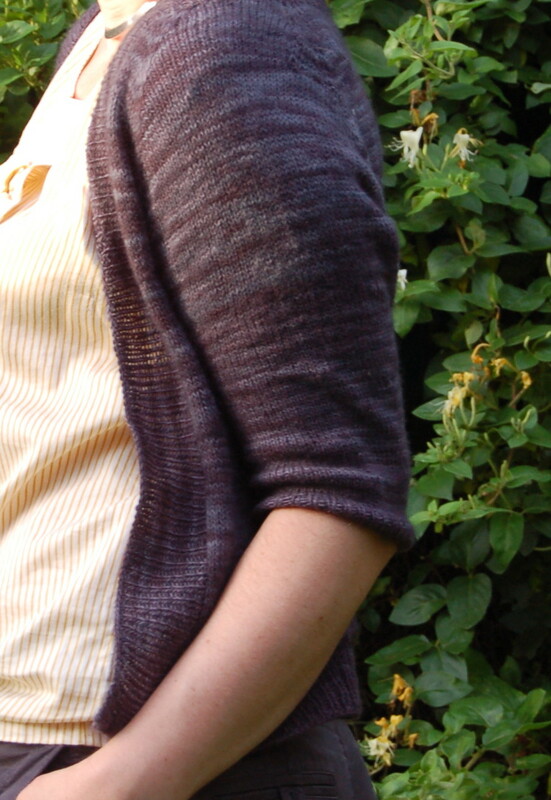 You may remember that I cast on for a Featherweight Cardigan way back in July . There was a rather terrible dog related incident but repairs were painstakingly made and the knit continued with no real problems. Indeed the pattern was a joy to knit, Hannah Fettig's patterns are well written and simple to follow, they make working with lace-weight yarn a pleasure, the knitting grows quicker than one might think and the simplicity of the design really shows off the beauty of the yarn. I used Malabrigo Lace which was adorable to work with and apparently makes itself quite adorable to young male ruffians of the canine kind. For once the knit was completed and lovingly blocked I set it carefully on top of the ironing pile ready to wear the next day. It could not be worn the next day, for it was discovered in the hooligan's bed, sporting a very large hole underarm. I felt rather despondent about the whole thing and just put it aside for weeks and weeks. Then one September evening I pulled it out again and set to work. Somehow I patched the offending area and somehow it really isn't so very bad. So you see, Featherweight Cardigan, the knit that almost never was. Oooooooooh yummy! The color is lovely. Isn't malabrigo a dream to knit with? I would have never thought to use lace weight for a sweater. It looks so soft and floaty. From here you'd never guess anything had gone awry, and it looks lovely! Butter AND knit? That's some appetite. It's beautiful - so glad you finished it. Lovely sweater, love the color. I crochet, but can't knit. Ha ha ha ... thanks for sharing your adventure with the cardi that almost didnt make it. I really admire your perseverance. Good job. Lovely! My featherweight is growing rather slowly I'm afraid! Naughty dog (but with good yarn taste)! It looks lovely on you. Oh it looks beautiful on you! And now it has a great story behind it, too. I've had this one on my to-make list for ages. Feeling very inspired now. Beautiful Featherweight - I love the richness of the colour. Great that it's looking lovely like this now. It's beautiful and obviously, someone else in your family thinks so too. I Love the pretty color! Another fabulous knit. I have trouble going back to something I've put down for a long period of time. I admire that you were able to finish this one. It's very pretty. I'm so glad you managed to save it. I do most of my sewing at the horse stable where my daughter has lessons. I am working on the same sweater (only in black). At this stable there is a dog who takes anything not protected..I have had to chase the sweater (thankfully in its protective travel bag) twice. It has taken forever to get done and I am having trouble getting through the second sleeve right now. I would BE SO UPSET if the darned dog had managed to put a hole on it. Good for you for making sure the dog did not gain a victory on that one..it is lovely. Hide that sweater! Or knit the dog is own sweater from some Malibrigo! It's so pretty. You must love it! What a terrible thing to happen to such beautiful knitting! But you did a great job rescuing it -and it looks perfect now. I'm very interested in the yarn you used - might just have to try it myself. I love the colour too.